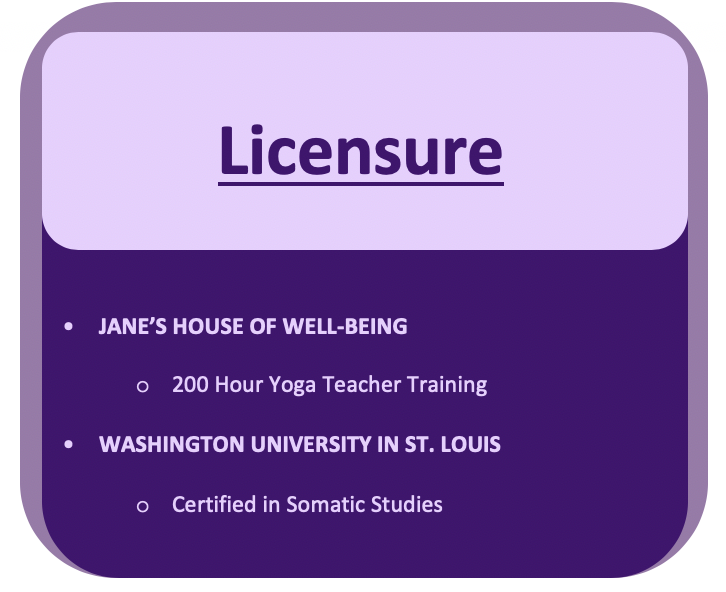 Susan has been a yoga instructor for 5 years and teaches at the St. Louis Wellness Center. Her passion for yoga started 20 years ago when she noticed a dramatic improvement in her health after attending yoga classes. 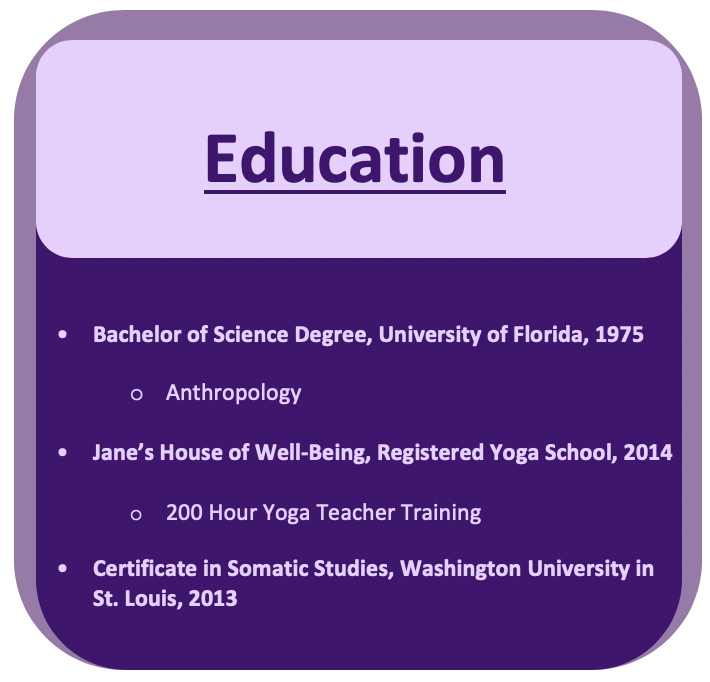 This led her to complete a 200 Hour RYT Yoga Teacher Training Course in 2014 at Jane’s House of Well-Being in St. Charles. She was trained in the Dynamic Yoga Method derived from master Godfrey Devereux. This method uses traditional Hatha yoga combined with intelligent sequencing of movement to enhance the yoga practice. The practice is based on sensitivity and guided by gentle flow of movement. It’s a systematic and powerful technique for mind-body integration and self-enquiry. Susan’s classes are designed for beginners to demonstrate how a regular practice of yoga can improve all the systems of the body (i.e. circulatory, respiratory, nervous, immune, bone health, and more) and bring the body to balance emotionally, physically, and spiritually. The class teaches basic hatha yoga postures, moving with breath, core techniques to open the body, and structural alignment for integration. Vinyasa Yoga: I believe in the healing power of yoga through improved body alignment which helps with neck and joint pain, as well as fatigue. I believe yoga is for everyone, any body type, and any age. My classes will have an emphasis on mind and body unity as experienced within and mindfulness. Susan Loftin's Vinyasa Yoga classes are from 6 - 7:15PM on Wednesdays of every week. You can find out more information about her classes by clicking here.